Last year, in response to Congress repealing the Obamacare individual mandate penalty beginning this January, the D.C. Council established its own requirement for District residents to maintain health coverage. If D.C. leaders wished to replicate Obamacare on the local level, they have succeeded beyond their wildest expectations—right down to the non-functioning website. For nearly six months—including the first month of open enrollment—the District failed to inform visitors to its online insurance exchange about the new coverage requirement. When District officials finally discovered their webpage fail, what did they do to admit their fault, and tell the public? Nothing. When Congress took steps to try and defund the D.C. insurance mandate last summer, District officials complained, calling it an intrusion on their authority. But after having bungled their website and failed to tell the public about the mix-up, how can they now claim competence to manage their own affairs? By stating that the requirement remained in effect for 2017 and 2018, the webpage implied that the mandate will disappear in 2019. But while the federal penalty disappeared on January 1, the District’s own insurance mandate replaced the federal requirement on that date. However, the webpage I saw did not mention the D.C. mandate at all. It looks like no one updated the page prior to open enrollment to reflect the District’s new coverage requirement. D.C. Health Link officials had almost six months between the June passage of the District’s mandate and the start of open enrollment in November to change the webpage’s content. Yet despite having a budget of more than $30 million, including an annual IT budget of more than $11 million, and more than 100 employees, no one attended to this basic task. By discussing the expiring federal mandate and not the new D.C. requirement, the webpage I viewed did not just provide misleading statements about the need to maintain coverage in 2019, it contained inaccurate information, too. The webpage noted that the federal mandate did not penalize individuals with short gaps of coverage of under three months—but the District’s stricter law requires individuals to maintain health coverage every single month. The webpage also directed individuals seeking exemptions from the mandate to apply to federal authorities, even though the D.C. exchange has assumed that role for the District’s mandate, effective January 1. Which do you think is more important for District residents to know: That the website won some awards, or that if they do not buy “government-approved” coverage, they could have their property seized and sold? District officials seem more pre-occupied with bragging about their website than updating their website. For instance, during the November meeting of the D.C. Health Benefit Exchange Authority, no one discussed the flawed webpage about the District’s individual mandate, even though D.C. Health Link staff conducted a presentation for the board explaining the website that showed a link to the flawed webpage. The November board meeting also showed a video of D.C. Mayor Muriel Bowser’s appearance at the launch event for open enrollment. During that event, Bowser gave remarks claiming that “D.C. Health Link has made navigating its website even easier.” Bowser failed to mention that, even as she spoke, that “easier” website included incorrect, flawed, and misleading information about the individual mandate she had signed into law months previously. Of course, if Bowser herself purchased insurance from the D.C. Health Link, she might have recognized those obvious errors on the site. But as the mayor told me in November, she—like other District officials—does not, and will not, buy exchange coverage herself, despite signing into law legislation requiring District residents making far less than she to do so. Nearly one month into open enrollment, on November 28, it appears D.C. Health Link finally discovered their error. Officials removed access to the page discussing the expiring federal mandate—the Internet Archive captured the old page—and created a new page discussing the District’s new coverage requirement for 2019. But did District officials publicly admit that their website included incorrect information, try to inform the public, or make things right with those who viewed that incorrect information? No, no, and no. The Exchange Authority board held their most recent monthly meeting in mid-December, and the incident did not come up at all. When healthcare.gov famously crashed and burned in 2013, then-Health and Human Services Secretary Kathleen Sebelius publicly accepted responsibility for the website “debacle.” By contrast, Mila Kofman, executive director of the Exchange Authority, apparently wants to pretend that the problems with the website she runs never took place. Beyond raising obvious questions of competence, the flawed webpage could have very real consequences for District residents. Any individuals who went to the incorrect webpage during the first month of open enrollment, and used its erroneous information to decide not to purchase health coverage for 2019, will face tax penalties when filing their 2019 returns in April 2020—penalties directly resulting from the bungling of District bureaucrats. But in this case, circumstances didn’t prevent individuals from obtaining coverage—they prevented individuals from understanding the consequences of not doing so. D.C. Health Link therefore may not have the authority to solve a problem its own staff caused. To ensure that no one incurs financial penalties because of the botched exchange website, the D.C. Council—or, better yet, Congress—will have to intervene. They should take the opportunity presented by this affair to repeal the mandate entirely. Or Congress could use the pending appropriations legislation to include the provisions adopted last summer defunding the District’s mandate. Rep. Gary Palmer (R-AL), who sponsored the defunding amendment last summer, once again offered his amendment earlier this month, when the House considered anew the District of Columbia appropriations measure. Unfortunately, however, the new House Democrat majority refused to make a vote on the amendment in order. This means that, absent additional action, individuals may face sizable tax penalties due to a website mess caused entirely by District officials. No matter what form it takes, the website mess demonstrates that the District’s insurance mandate should go. Given that D.C. Health Link spends $11 million on IT, yet took six months to update a webpage, it should spend less time ordering District residents to buy insurance and more time getting its own house in order. This post was originally published at The Federalist. Put aside for a moment specific questions about the wall itself—whether it will deter illegal immigration, how much to spend on it, or even whether to build it. The Trump tweet illustrates a much larger problem facing congressional Republicans: They don’t want to fight—about the wall, or about much of anything, particularly spending. Voting for the Mandate after They Voted Against It? Take for instance an issue I helped raise awareness of, and have helped spend the past several weeks tracking: The District of Columbia’s move to re-establish a requirement on district residents to purchase health insurance. As I wrote last week, Sen. Ted Cruz (R-TX) offered an amendment in the Senate that would defund this mandate. The amendment resembles one that Rep. Gary Palmer (R-AL) offered in the House, and which representatives voted to add to the bill. If a successful vote on the Cruz amendment inserted the provision in the Senate version of the bill, the defunding amendment would presumably have a smooth passage to enactment. So what’s holding it up? In a word, Republicans. According to Senate sources, Republican leaders—and Republican members of the Appropriations Committee—don’t want to vote on Cruz’s amendment. Several outside groups have stated they will key-vote in favor of the amendment, and the leadership types don’t want to vote against something that many conservative groups support. But why would Republican senators vote against Cruz’ amendment? After all, every one of them voted for an effective repeal of the federal individual mandate in the tax bill last December. Given that Congress exercises ultimate sovereignty over the district, it would seem more than a little incongruous for senators to (to coin a phrase) vote for the individual mandate after voting against it last year. In short, because Democrats might object. Appropriations measures need 60 votes to break a Senate filibuster, and Democrats have said they will not vote for any bill that includes so-called “poison pill” appropriations riders. The definition of a “poison pill” of course lies in the eyes of the beholder. That “kumbaya” dynamic has led Senate Republican leaders and appropriators to try and avoid the Cruz amendment entirely. They don’t want to vote against the amendment, because conservatives like me support it and will (rightly) point out their hypocrisy if they do. But they don’t want the amendment to pass either, because they fear that Democrats won’t vote to pass the underlying bill if it does. So they hope the amendment will die a quiet death. It’s a kabuki show, an exercise in failure theater. On the downside, the amendment may not pass, because appropriators don’t want it to. But on the upside, if provisions like the Cruz amendment remain out of the bill, at least Congress will get the opportunity to bust through budget caps and go on another spending binge! At this point some leadership types might point out that it’s easy for people like me to sit on the sidelines and criticize, but that Republicans in Congress must actually govern. That point has more than a grain of truth to it. On the other hand, “governing” for Republicans usually means “governing like Democrats.” Case in point: The sorry spectacle I described in March, wherein Republican committee chairmen—who, last I checked, won election two years ago on a platform of repealing Obamacare—begged Democrats to include a bailout of Obamacare’s exchanges in that month’s 2,200-page omnibus appropriations bill. The chairmen in question, and many Republican leaders, feared the party will get blamed in the fall for premium increases. So they decided to “govern” by abandoning all pretense of repealing Obamacare and trying to bolster the law instead, even though their failure to repeal Obamacare is a key driver of the premium increases driving Americans crazy. That dynamic, as much as anything else, prompted Sunday’s presidential tweet. While Trump fixates on the wall, the larger issue—Republican leaders promising confrontation and action, and often delivering precious little of either—helped lay the foundation for his rise in the Republican presidential primaries. Always wary of betraying the base that elected them, he feels a visceral need to deliver, in spite of (or perhaps because of) the cost. With an election on the horizon, bicameral negotiations surrounding the spending bill could get hairy in September, because two of the parties come to the table with fundamentally different perspectives. Republican congressional leaders worry about what might happen in November if they fail to govern because they stood up for conservative policies. Trump worries about what might happen if they don’t. UPDATE: On Wednesday afternoon, the Senate voted to table the Cruz amendment blocking DC’s individual mandate. Five Republicans who voted to repeal the individual mandate in tax reform legislation last fall — Louisiana’s Bill Cassidy, Maine’s Susan Collins, Alaska’s Lisa Murkowski, Alabama’s Richard Shelby, and Utah’s Orrin Hatch — voted to table, or kill, the amendment. Because the vote came on a motion to table, senators may attempt to argue that the vote was procedural in nature, and did not represent a change in position on the mandate. Shelby, the chair of the Appropriations Committee, said he supported the underlying policy behind the Cruz amendment, but voted not to advance the amendment because Democrats objected to its inclusion. Once again, the movement to expand government-run health care continues apace. No sooner had one think tank published a paper calling for the return of an individual mandate at the federal level than the liberal Commonwealth Fund published a paper, released on Friday, calling for states to impose their own Obamacare-style mandates at the state level. Ironically, the report comes on a week when Congress took steps to undo one state-level mandate before it ever takes effect. I had noted earlier this week that Rep. Gary Palmer (R-AL), in response to my reporting on the District of Columbia’s health insurance mandate, proposed an amendment to the DC appropriations bill defunding the measure. Late Wednesday evening, the House of Representatives adopted the amendment by a 226-189 vote. Next week, the Senate could take up its version of the District of Columbia appropriations bill. If a similar amendment passes on the Senate floor, then the final version of the appropriations measure likely will contain the defunding language—thus preventing individuals who do not buy “government-approved” health coverage from having their property seized by DC authorities. As to the Commonwealth report itself: It concludes that enacting an individual mandate in all 50 states would increase insurance coverage by roughly 3.9 million in 2019. Nearly half of those individuals (1.7 million) would comprise individuals purchasing unsubsidized exchange coverage—the people for whom Bill Clinton said Obamacare was the “craziest thing in the world,” because they don’t receive subsidies (which might explain why they won’t purchase insurance unless the government taxes them for not doing so). Individuals enrolling in Medicaid (600,000), subsidized exchange policies (1.1 million), and employer plans (450,000) comprise the rest of the coverage gains. As health care costs get more expensive relative to incomes over time, fewer people tend to purchase insurance and the number of uninsured rises. However, with an individual mandate in place, the effect of health care cost growth is lessened because more people hold on to their insurance to comply with the mandate. As a result, the effect of the individual mandate on reducing the number of people without insurance increases over time in percentage terms. In other words, as health costs, and therefore premiums, continue to skyrocket, fewer people can afford coverage, and more and more people will buy coverage only if government forces them to do so. (I bet those people would take umbrage with Commonwealth’s claim that forcing them to buy coverage they cannot afford “lessens…the effect of health care cost growth.”) That’s Commonwealth’s vision for the future—government exerting more and more control on its citizens. Wasn’t Obamacare Supposed to Reduce Health Costs? The obvious question: Why would health care costs continue to “get more expensive relative to income over time”? Wasn’t Obamacare supposed to fix all that? Recall that during his 2008 campaign, Barack Obama repeatedly promised that his health plan would cut families’ premiums by $2,500 per year. Commonwealth provided some of the intellectual firepower behind the pledge, releasing in 2007 a report that it claimed could save $1.5 trillion in health expenditures over 10 years. Many of that report’s proposals, although not all (limiting Medicare’s coverage of expensive drugs and treatments being an obvious exception), made their way into the measure that became Obamacare. In 2013, Commonwealth upped the ante, releasing another report whose recommendations promised $2 trillion in lower health spending over a decade. Yet Commonwealth’s report released Friday admits that health costs in 2022 will continue to rise faster than income, resulting in more and more people feeling squeezed to afford coverage. At this rate, Commonwealth should stop putting out reports talking about all the health costs we could save. Our country can’t afford them. The same premise underpins both Commonwealth’s paper on state insurance mandates and its proposals to “reduce” health costs: Just give us more power, and we’ll solve all your problems for you. Yet those problems never actually seem to go away. In 2009, Democrats had 60 votes in the Senate and a huge margin in the House, so they could enact whatever health care policies they wished—and did just that. Yet for Commonwealth and the Left, it wasn’t enough. It’s never enough. Given that dynamic, who would want to give people like the researchers at Commonwealth even more control over the health care system? The question should answer itself. Two weeks ago, I described how provisions in a budget bill that the District of Columbia Council quietly passed would extend the reach of government-controlled health care in the nation’s capital. 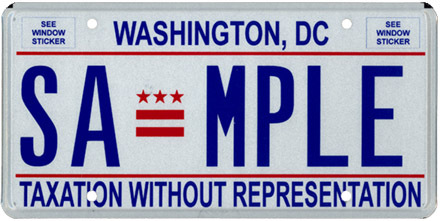 The provisions buried in that budget bill would not only reimpose the health insurance mandate penalty within the District of Columbia that Congress set to zero beginning in January, but would go further, by allowing DC authorities to place liens on, seize, and sell the property of individuals who cannot afford to pay the mandate tax. Thankfully, my post had its intended effect in raising awareness of the issue among federal policy-makers. The office of Rep. Gary Palmer (R-AL) responded, introducing an amendment to appropriations legislation that the House of Representatives will consider this week. If enacted into law, the Palmer amendment would prohibit any funds provided in the bill—which includes the District of Columbia’s annual budget—from being used to implement the new health insurance mandate. By defunding the mandate, the Palmer amendment would effectively prohibit this tax increase, to say nothing of the threat of property seizures, from affecting residents of the nation’s capital. The Palmer amendment would also allow individuals to purchase the type of health coverage they desire without getting hit with a “stealth” tax bill after-the-fact. If the District’s law goes into effect in January, individuals buying the new, more affordable coverage options proposed by the Trump administration could face exactly that. The mandate the DC Council approved (see pages 168-82 here) effectively re-imposes on the District Obamacare’s individual mandate as it existed last December 15—the date the congressional conferees on the tax bill filed their conference report (i.e., before legislation setting the federal mandate penalty to zero was signed into law). By linking the District’s mandate to the policies and regulations in place as of last December 15, the DC mandate also prevents the new options the Trump administration is introducing from qualifying as “minimum essential coverage” for purposes of complying with the mandate. Health coverage provided under a multiple employer welfare arrangement; provided that the multiple employer welfare arrangement provided coverage in the District on December 15, 2017, or complies with federal law and regulations applicable to multiple employer welfare arrangements that were in place as of December 15, 2017. This language effectively prohibits coverage under the Trump administration’s new association health plans, which the administration first proposed in the Federal Register edition of January 5, 2018, from qualifying under the District’s health insurance mandate. Individuals who purchase such plans would face a tax penalty the following year, unless they also purchased other qualifying coverage (an unlikely scenario). The District’s statute also would exclude short-term health plans from qualifying as “minimum essential coverage” for purposes of its health insurance mandate. Obamacare itself defined “minimum essential coverage” to include “coverage under a health plan offered in the individual market within a state.” But because another portion of federal law says “‘individual health insurance coverage’ means health insurance coverage offered to individuals in the individual market, but does not include short-term limited duration insurance,” short-term plans would not qualify. Obamacare did give the secretary of Health and Human Services, along with the secretary of the Treasury, discretion in determining other forms of “minimum essential coverage” for purposes of the federal mandate. However, because the District linked its mandate to those federal definitions in effect as of December 15, 2017—well before the Trump administration first proposed its changes to the regulation of short-term plans on February 20, 2018—short-term plans would not qualify as acceptable coverage under the District’s mandate. District residents who purchase short-term plans, like those who access the expanded association health plans, would not comply with the new coverage requirements. Particularly given the very quiet way the DC Council enacted the legislation, many individuals may not know that the District re-imposed a health insurance mandate or that certain types of coverage do not comply with it, and face an unpleasant tax “surprise” in the spring of 2020 (as they file their DC tax returns for 2019). Unless, of course, Congress enacts the Palmer amendment into law. As Congress debates the Palmer amendment this week, expect all manner of self-righteous indignation from DC officials over the federal legislature interfering in the District’s affairs. Such complaints of course ignore the fact that the Constitution places sovereignty over the nation’s capital squarely within the federal purview. Moreover, it also belies the fact that DC officials made little attempt—one could argue purposefully made little attempt—to publicize the council’s deliberations over this change. I e-mailed three people in Mayor Muriel Bowser’s press office about the council’s actions two weeks ago, and still have yet to receive so much as an acknowledgement. Bowser can argue all she wants about “Taxation without Representation,” but given that her office made zero attempt to represent me, she has little right to complain. The House should pass the Palmer amendment this week, and prevent the strong-arm tactics associated with government-controlled health care from taking root in the nation’s capital. Is CBO Working with Budget Committee Staff to Hide an Illegal Obamacare Bailout? It appears my recent article, which raised questions about whether the Congressional Budget Office (CBO) illegally manipulated the budget baseline to ease the passage of an Obamacare “stability” bill, hit a nerve. To borrow a current metaphor, if there were any more collusion between the House Budget Committee and CBO on this issue, Rod Rosenstein would need to appoint a special counsel to investigate. Consider a series of questions asked by Rep. Diane Black (R-TN) at House Budget’s April 12 hearing on the new Budget and Economic Outlook. Black asked CBO Director Keith Hall about the agency’s treatment of the law’s cost-sharing reduction payments (CSRs), which President Trump cancelled in October. Several elements of this exchange stand out. Black asked about this issue, and only this issue. After completing her exchange with Hall on CSRs, she yielded back more than half of the five minutes allotted to her for questions—an unusual occurrence. Think about it: How often have you seen members of Congress take two minutes to give a five-minute speech? Black began the exchange by asking Hall a very friendly, and some would argue leading, question: “Is CBO doing this [i.e., changing the budgetary baseline] in full compliance with” the law? In response, Hall looked down at his notes no fewer than seven times in a roughly 45-second response. Particularly during the seventh and final instance, Hall quite clearly appears to be reading from his briefing materials. Members of Congress often read questions at hearings, but in nearly 15 years of working on and around Capitol Hill, I can recall precious few times where witnesses read answers. Based on these circumstances, it seems reasonable to conclude that the exchange was scripted well in advance. If that’s the case, it appears Black, and whomever wrote her questions, worked with CBO to choreograph an exchange designed to rebut one of my allegations, namely, that CBO violated the Gramm-Rudman-Hollings Act in making this budgetary change. Mind you, the change does violate the law, Hall’s claims notwithstanding. CBO can claim that the budget baseline funds CSRs indirectly—via “higher premiums and larger premium tax credit subsidies”—only by assuming that Congress does not fund CSRs directly. Later in the April 12 hearing, Rep. Gary Palmer (R-AL) also queried Hall on the circumstances behind this questionable change. Palmer asked Hall: “Why did you change that [i.e., raise the baseline]?…You would have had to have gotten instruction to” make the alteration. Hall didn’t directly answer the question: He claimed CBO had the authority to make the change, but never said where his instruction came from. His instruction had to come from somewhere. As I noted in my initial article, Hall told both Republicans and Democrats at a January 30 House Budget Committee hearing that he would not alter the baseline with regard to CSRs unless and until he got instructions from the budget committees to do so. But the budget committees already gave CBO instructions—which CBO suddenly chose to ignore. In an October estimate of Obamacare “stability” legislation, the budget office specifically said that “after consultation with the Budget Committees, CBO has not changed its baseline” to reflect the Trump administration’s cancellation of the CSR payments. Last week’s updated CBO document, which altered the budgetary baseline, said nothing about consultation with the budget committees—a break from the October precedent, and a direct violation of Hall’s promise in his January 30 testimony. What changed? Did the CBO director just wake up one morning and decide to make a scoring change affecting $200 billion in taxpayer dollars? Or did someone pressure the CBO director to make that change—and if so, who? If the House Budget Committee staff knows—and I’d bet they do—they certainly don’t want to say. At first my repeated e-mails to committee staff disappeared into dead air. Once I noted this radio silence on Twitter, I got a response, but not a substantive reply. The House Budget Committee’s communications director said my queries were within CBO’s purview, and sent me to them. I followed up with a very specific question: Did House Budget hear from anyone at CBO about this scoring change prior to release of the revised baseline? As I noted in my e-mail to the committee, that question lies very clearly within its own purview, and it’s unclear why they would direct me to CBO on this issue, unless the goal is not to answer the question. If House Budget admits that CBO did reach out to them about this scoring change, that places the fingerprints of House leadership on a heavy-handed attempt to strong-arm CBO and alter scoring rules in a way that favors an Obamacare bailout—the issue I first wrote about back in January. If House Budget admits that CBO did not reach out to them about this scoring change, that means CBO “went rogue,” and increased spending on Obamacare subsidies by $194 billion without guidance or direction from the elected members of Congress who govern it. It also raises questions of whether Hall materially misled the Budget Committee (a felony offense) during his January 30 testimony. Answering my question involves someone assuming responsibility for this mysterious occurrence. Because no one wants to assume responsibility for the chicanery behind this budget gimmick, apparently people think, or hope, that ignoring questions will make them go away. (I haven’t yet reached out to CBO for a comment, but anyone want to lay odds that their spokesman says, “I’m sorry, but we can’t disclose our communications with members of Congress”?) News flash: They’re not. If CBO and House Budget are completely blameless, and everything about this budget change occurred in an above-board manner, they seem to have a funny way of going about proving their innocence—sidestepping questions. Not two months ago, Hall testified before the House Budget Committee about the ways CBO will improve transparency surrounding the budget process. If he wants to follow through on his promise, then Hall (to say nothing of House Budget) should start by disclosing exactly who ordered CBO to make this change—the sooner, the better. Ahead of tomorrow’s expected vote on the American Health Care Act, below please find updates on the amendments offered to the legislation. The original summary of the bill is located here. The bill will be considered tomorrow in the absence of a Congressional Budget Office score of any of 1) the second-degree managers amendment; 2) the Palmer-Schweikert amendment; 3) the MacArthur-Meadows amendment; and 4) the Upton amendment. Some conservatives may be concerned that both the fiscal and policy implications of these four legislative proposals will not be fully vetted until well after Members vote on the legislation. Some conservatives may also be concerned that changes to the legislation made since the last CBO analysis (released on March 23) could change its deficit impact — which could, if CBO concludes the amended bill increases the deficit, cause the legislation to lose its privilege as a reconciliation matter in the Senate. UPTON AMENDMENT: Adds an additional $8 billion to the Stability Fund for the period 2018-2023 for the sole purpose of “providing assistance to reduce premiums or other out-of-pocket costs of individuals who are subject to an increase in the monthly premium rate for health insurance coverage” as a result of a state adopting a waiver under the MacArthur/Meadows amendment. Gives the Secretary of Health and Human Services authority to create “an allocation methodology” for such purposes. Some conservatives may note that the adequacy (or inadequacy) of the funding remains contingent largely upon the number of states that decide to submit relevant waiver requests. Some conservatives may also be concerned by the broad grant of authority given to HHS to develop the allocation with respect to such important details as which states receive will funding (and how much), the amount of the $8 billion disbursed every year over the six-year period, and which types of waiver requests (e.g., age rating changes, other rate changes, and/or essential health benefit changes) will receive precedence for funding. In states that have established some high-risk pool or reinsurance mechanism, the 30 percent penalty in the bill for individuals lacking continuous coverage, and/or Obamacare’s prohibition on rating due to health status (again, for individuals lacking continuous insurance coverage), beginning after the 2018 open enrollment period. Provides that the waiver will be considered approved within 60 days, provided that the state self-certifies the waiver will accomplish one of several objectives, including lowering health insurance premiums. Allows waivers to last for up to 10 years, subject to renewal. Exempts certain forms of coverage, including health insurance co-ops and multi-state plans created by Obamacare, from the state waiver option. Also exempts the health coverage of Members of Congress from the waiver requirement. House leadership has claimed that this language was included in the legislation to prevent the bill from losing procedural protection in the Senate (likely for including matter outside the jurisdiction of the Senate Finance and HELP Committees). The House will vote on legislation (H.R. 2192) tomorrow that would if enacted effectively nullify this exemption. While commending the attempt to remove the regulatory burdens that have driven up insurance premiums, some conservatives may be concerned that the language not only leaves in place a federal regulatory regime, but maintains Obamacare as the default regime unless and until a state applies for a waiver — and thus far no governor or state has expressed an interest in doing so. Some conservatives may also question whether waivers will be revoked by states following electoral changes (i.e., a change in party control), and whether the amendment’s somewhat permissive language gives the Department of Health and Human Services grounds to reject waiver renewal applications — both circumstances that would further limit the waiver program’s reach. PALMER/SCHWEIKERT AMENDMENT: Adds an additional $15 billion to the Stability Fund for the years 2018 through 2026 for the purpose of creating an invisible risk sharing program. Requires the Centers for Medicare and Medicaid Services to establish, following consultations with stakeholders, parameters for the program, including the eligible individuals, standards for qualification (both voluntary and automatic), and attachment points and reimbursement levels. Provides that the federal government will establish parameters for 2018 within 60 days of enactment, and requires CMS to “establish a process for a state to operate” the program beginning in 2020. Some conservatives may be concerned that this amendment is too prescriptive to states — providing $15 billion in funding contingent solely on one type of state-based insurance solution — while at the same time giving too much authority to HHS to determine the parameters of that specific solution. Allows states to set essential health benefits for health plans, beginning in 2018. Earlier on Thursday, the Congressional Budget Office released an updated cost estimate regarding the managers amendment. CBO viewed its coverage and premium estimates as largely unchanged from its original March 13 projections. However, the budget office did state that the managers package would reduce the bill’s estimated savings by $187 billion — increasing spending by $49 billion, and decreasing revenues by $137 billion. Of the increased spending, $41 billion would come from more generous inflation measures for some of the Medicaid per capita caps, and $8 billion would come from other changes. Of the reduced revenues, $90 billion would come from lowering the medical care deduction from 7.5 percent to 5.8 percent of income, while $48 billion would come from accelerating the repeal of Obamacare taxes compared to the base bill. Note that this “updated” CBO score released Thursday afternoon does NOT reflect any of the changes proposed Thursday evening; scores on that amendment will not be available until after Friday’s expected House vote. Net investment tax (lowers revenue by $172.2 billion). On March 23, the Congressional Budget Office released an updated cost estimate regarding the managers amendment. CBO viewed its coverage and premium estimates as largely unchanged from its original March 13 projections. However, the budget office did state that the managers package would reduce the bill’s estimated savings by $187 billion — increasing spending by $49 billion, and decreasing revenues by $137 billion. Of the increased spending, $41 billion would come from more generous inflation measures for some of the Medicaid per capita caps, and $8 billion would come from other changes. Of the reduced revenues, $90 billion would come from lowering the medical care deduction from 7.5 percent to 5.8 percent of income, while $48 billion would come from accelerating the repeal of Obamacare taxes compared to the base bill. On the evening of March 20, House Republicans released two managers amendments to the American Health Care Act—one making policy changes, and the other making “technical” corrections. The latter amendment largely consists of changes made in an attempt to avoid Senate points-of-order fatal to the reconciliation legislation. In general, the managers amendment proposes additional spending (increasing the inflation measure for the Medicaid per capita caps) and reduced revenues (accelerating repeal of the Obamacare taxes) when compared to the base bill. However, that base bill already would increase the deficit over its first five years, according to the Congressional Budget Office. Moreover, neither the base bill nor the managers amendment—though ostensibly an Obamacare “repeal” bill—make any attempt to undo what Paul Ryan himself called Obamacare’s “raid” on Medicare, diverting hundreds of billions of dollars from that entitlement to create new entitlements. Given this history of financial gimmickry and double-counting, not to mention our $20 trillion debt, some conservatives may therefore question the fiscal responsibility of the “sweeteners” being included in the managers package. Medicaid Expansion: Ends the enhanced (i.e., 90-95%) federal Medicaid match for all states that have not expanded their Medicaid programs as of March 1, 2017. Any state that has not expanded Medicaid to able-bodied adults after that date could do so—however, that state would only receive the traditional (50-83%) federal match for their expansion population. However, the amendment prohibits any state from expanding to able-bodied adults with incomes over 133% of the federal poverty level (FPL) effective December 31, 2017. With respect to those states that have expanded, continues the enhanced match through December 31, 2019, with states receiving the enhanced match for all beneficiaries enrolled as of that date as long as those beneficiaries remain continuously enrolled in Medicaid. Some conservatives may be concerned that this change, while helpful, does not eliminate the perverse incentive that current expansion states have to sign up as many beneficiaries as possible over the next nearly three years, to receive the higher federal match rate. Work Requirements: Permits (but does not require) states to, beginning October 1, 2017, impose work requirements on “non-disabled, non-elderly, non-pregnant” beneficiaries. States can determine the length of time for such work requirements. Provides a 5 percentage point increase in the federal match for state expenses attributable to activities implementing the work requirements. States may not impose requirements on pregnant women (through 60 days after birth); children under age 19; the sole parent of a child under age 6, or sole parent or caretaker of a child with disabilities; or a married individual or head of household under age 20 who “maintains satisfactory attendance at secondary school or equivalent,” or participates in vocational education. Medicaid Per Capita Caps: Increases the inflation measure for Medicaid per capita caps for elderly, blind, and disabled beneficiaries from CPI-medical to CPI-medical plus one percentage point. The inflation measure for all other enrollees (e.g., children, expansion enrollees, etc.) would remain at CPI-medical. Medicaid “New York Fix:” Reduces the federal Medicaid match for states that require their political subdivisions to contribute to the costs of the state Medicaid program. Per various press reports, this provision was inserted at the behest of certain upstate New York congressmen, who take issue with the state’s current policy of requiring some counties to contribute towards the state’s share of Medicaid spending. Some conservatives may be concerned that this provision represents a parochial earmark, and question its inclusion in the bill. Medicaid Block Grant: Provides states with the option to select a block grant for their Medicaid program, which shall run over a 10-year period. Block grants would apply to adults and children ONLY; they would not apply with respect to the elderly, blind, and disabled population, or to the Obamacare expansion population (i.e., able-bodied adults). Requires states to apply for a block grant, listing the ways in which they shall deliver care, which must include 1) hospital care; 2) surgical care and treatment; 3) medical care and treatment; 4) obstetrical and prenatal care and treatment; 5) prescription drugs, medicines, and prosthetics; 6) other medical supplies; and 7) health care for children. The application will be deemed approved within 30 days unless it is incomplete or not actuarially sound. Bases the first year of the block grant based on a state’s federal Medicaid match rate, its enrollment in the prior year, and per beneficiary spending. Increases the block grant every year with CPI inflation, but does not adjust based on growing (or decreasing) enrollment. Permits states to roll over block grant funds from year to year. Some conservatives, noting the less generous inflation measure for block grants compared to per capita caps (CPI inflation for the former, CPI-medical inflation for the latter), and the limits on the beneficiary populations covered by the block grant under the amendment, may question whether any states will embrace the block grant proposal as currently constructed. Implementation Fund: Creates a $1 billion fund within the Department of Health and Human Services to implement the Medicaid reforms, the Stability Fund, the modifications to Obamacare’s subsidy regime (for 2018 and 2019), and the new subsidy regime (for 2020 and following years). Some conservatives may be concerned that this money represents a “slush fund” created outside the regular appropriations process at the disposal of the executive branch. Retroactive Eligibility: Strikes Section 114(c), which required Medicaid applicants to provide verification of citizenship or immigration status prior to becoming presumptively eligible for benefits during the application process. The section was likely stricken for procedural reasons to avoid potentially fatal points-of-order, for imposing new programmatic requirements outside the scope of the Finance Committee’s jurisdiction and/or related to Title II of the Social Security Act. Safety Net Funding: Makes changes to the new pool of safety net funding for non-expansion states, tying funding to fiscal years instead of calendar years 2018 through 2022. Medicaid Per Capita Cap: Makes changes to cap formula, to clarify that all non-Disproportionate Share Hospital (DSH) supplemental payments are accounted for and attributable to beneficiaries for purposes of calculating the per capita cap amounts. Stability Fund: Makes technical changes to calculating relative uninsured rates under formula for allocating Patient and State Stability Fund grant amounts. Continuous Coverage: Strikes language requiring 30 percent surcharge for lack of continuous coverage in the small group market, leaving the provision to apply to the individual market only. With respect to the small group market, prior law HIPAA continuation coverage provisions would still apply. Re-Write of Tax Credit: Re-writes the new tax credit entitlement as part of Section 36B of the Internal Revenue Code—the portion currently being used for Obamacare’s premium subsidies. In effect, the bill replaces the existing premium subsidies (i.e., Obamacare’s refundable tax credits) with the new subsidies (i.e., House Republicans’ refundable tax credits), effective January 1, 2020. The amendment was likely added for procedural reasons, attempting to “bootstrap” on to the eligibility verification regime already in place under Obamacare. Creating a new verification regime could 1) exceed the Senate Finance Committee’s jurisdiction and 2) require new programmatic authority relating to Title II of the Social Security Act—both of which would create a point-of-order fatal to the entire bill in the Senate. In addition, with respect to the “firewall”—that is, the individuals who do NOT qualify for the credit based on other forms of health coverage—the amendment utilizes a definition of health insurance coverage present in the Internal Revenue Code. By using a definition of health coverage included within the Senate Finance Committee’s jurisdiction, the amendment attempts to avoid exceeding the Finance Committee’s remit, which would subject the bill to a potentially fatal point of order in the Senate. However, in so doing, this ostensibly “technical” change restricts veterans’ access to the tax credit. The prior language in the bill as introduced (pages 97-98) allowed veterans eligible for, but not enrolled in, coverage through the Veterans Administration to receive the credit. The revised language states only that individuals “eligible for” other forms of coverage—including Medicaid, Medicare, SCHIP, and Veterans Administration coverage—may not qualify for the credit. Thus, with respect to veterans’ coverage in particular, the managers package is more restrictive than the bill as introduced, as veterans eligible for but not enrolled in VA coverage cannot qualify for credits. Finally, the amendment removes language allowing leftover credit funds to be deposited into individuals’ health savings accounts—because language in the base bill permitting such a move raised concerns among some conservatives that those taxpayer dollars could be used to fund abortions in enrollees’ HSAs. Last Thursday afternoon, the House Rules Committee approved an amendment providing an additional $15 billion for “invisible high risk pools.” That surprising development, after several days of frenetic closed-door negotiations and a study on the pools released Friday, may have some in Washington trying to make sense of it all. If you want the short and dirty, here it is: Thursday’s amendment doesn’t resemble the model cited by pool proponents, undermines principles of federalism, relies on government price controls to achieve much of its premium savings, and requires far more taxpayer funding than the amendment actually provided. But other than that, it’s great! Want more info? Read on. The legislative text the Rules Committee adopted last week bears little resemblance to the invisible risk pool model the amendment’s proponents have described. In response to my article last week asking whether the invisible risk pool funding differs from Obamacare’s reinsurance program, supporters cited a blog post highlighting the way such a pool works in Maine. Under Maine’s program, insurers cede their highest risks to the pool prospectively—i.e., when individuals apply for insurance. Insurers also cede to the pool most of those high-risk patients’ premium payments, to help pay for the patients’ health claims. Conversely, insurers participating in Obamacare’s reinsurance program receive retrospective payments (i.e., after the patients incur high health costs), and keep all of the premium payments those patients make. In theory, then, those two differences do distinguish the Obamacare reinsurance program from the Maine pool. The [Milliman] study…assumes that insurers would agree up front to surrender most of the premiums paid by high-risk enrollees, in exchange for protection against potentially costly claims down the line… Palmer included those specifics the first time he proposed adding a risk-sharing program to the [American Health Care Act], roughly two weeks ago. But they were stripped out of the final version presented Tuesday, and likely for good reason…Insurers likely wouldn’t be too enthusiastic about having that much skin in the game. Instead, the amendment essentially tells state and federal officials to sort out the details later—and most importantly, after the program is passed into law. The federal pools may end up looking nothing like the Maine program advocates are citing as the model—because the administration will determine all those critically important details after the fact. Or, to coin a phrase, we have to pass the bill so that you can find out what’s in it. As currently constructed, the pool concept undermines state sovereignty over insurance markets. Paradoxical as it may sound, the amendment adopted last Thursday is both too broad and too narrow. With respect to the invisible high risk pool concept, the legislation doesn’t include enough details to allow policy-makers and insurers to determine how they will function. As noted above, all of those details were essentially punted to the administration to determine. But the amendment is also too narrow, in that it conditions the $15 billion on participation in the invisible risk pool model. If a state wants to create an actual high risk pool, or use some other concept to stabilize their insurance markets, they’re out of luck—they can’t touch the $15 billion pot of money. Admittedly, the amendment the Rules Committee adopted last Thursday isn’t nearly as bad as the original Palmer amendment on invisible pools. That original amendment required all insurers to participate in the invisible pools “as a condition of doing business in a state”—potentially violating both the Fifth Amendment for an unconstitutional taking against insurers, and the Tenth Amendment by undermining states’ sovereignty over their insurance markets and business licensing. In a post last week, I cited House Speaker Paul Ryan’s February criticism of Obamacare: “They’re subsidies that say, ‘We will pay some people some money if you do what the government makes you do.’” That’s exactly what this amendment does: It conditions some level of funding on states taking some specific action—not the only action, perhaps not even the best action, to stabilize their insurance markets, just the one Washington politically favors, therefore the one Washington will attempt to make all states take. Much of the supposed benefits of the pools come as a result of government-imposed price controls. The Milliman study released Friday—and again, conditioned upon parameters not present in the amendment the Rules Committee adopted Thursday—models two possible scenarios. The first scenario would create a new insurance pool in “repeal-and-replace” legislation, with the invisible pools applying only to the new market (some individuals currently on Obamacare may switch to the new market, but would not have to). The second scenario envisions a single risk pool for insurers, combining existing enrollees and new enrollees under the “replace” plan. In both cases, Milliman modeled assumptions from the original Palmer amendment (i.e., not the one the Rules Committee adopted last Thursday) that linked payments from the invisible risk pools to 100 percent of Medicare reimbursement rates. The study specifically noted the “favorable spread” created as a result of this requirement: the pool reduces premiums because it pays doctors and hospitals less than insurers would. Under the first scenario, in which Obamacare enrollees remain in a separate market than the new participants in “replace” legislation, a risk pool reimbursing at Medicare rates would yield total average rate reductions of between 16 and 31 percent. But “if [risk pool] benefits are paid based on regular commercially negotiated fees, the rate reduction becomes 12% to 23%”—about one-third less than with the federally dictated reimbursement levels. Under the second scenario, in which Obamacare and “replace” enrollees are combined into one marketplace, premiums barely drop when linked to commercial payment rates. Premiums would fall by a modest 4 to 14 percent using Medicare reimbursement levels, and a miniscule 1 to 4 percent using commercial reimbursement levels. Admittedly, the structure of the risk pool creates an inherent risk of gaming—insurers could try to raise their reimbursement rates to gain more federal funds from the pool. But if federal price controls are the way to lower premiums (and for the record, they aren’t), why not just create a government-run “public option” linked to Medicare reimbursement levels and be done with it? According to the study, the amendment adopted doesn’t include enough federal funding for invisible risk pools. The Milliman study found that invisible risk pools will require more funding than last Thursday’s amendment provided—and potentially even more funding than the entire Stability Fund. Under both scenarios, the invisible risk pools would require anywhere from $3.3 billion to $17 billion per year in funding, or from $35 billion to nearly $200 billion over a decade. By contrast, Thursday’s amendment included only $15 billion in funding to last from 2018 through 2026. And the Stability Fund itself includes a total of $130 billion in funding—$100 billion in general funds, $15 billion for maternity and mental health coverage, and the $15 billion specifically for invisible risk pools. If all 50 states participate, the entire Stability Fund may not hold enough money needed to fund invisible risk pools. Remember too that the Milliman study assumes that 1) insurers will cede most premium payments from risk pool participants to help finance the pool’s operations and 2) the pool will pay claims using Medicare reimbursement rates. If either or both of those two assumptions do not materialize—and insurers and providers will vigorously oppose both—spending for the pools will increase still further, making the Milliman study a generous under-estimate of the program’s ultimate cost. All of the above notwithstanding, the invisible high risk pool model could work for some states—emphasis on “could” and “some.” If states want to explore this option, they certainly have the right to do so. But, as Obamacare itself has demonstrated, Washington does not represent the source and summit of all the accumulated wisdom in health care policy. States are desperate for the opportunity to innovate, and create new policies in the marketplace of ideas—not have more programs foisted upon them by Washington, as the Rules Committee amendment attempts to do. Moving in the direction of the former, and not the latter, would represent a true change of pace. Here’s hoping that Congress finally has the courage to do so. At a Thursday morning press conference, Speaker Paul Ryan and House leaders unveiled amendment language providing an additional $15 billion in funding for “invisible high risk pools,” which the House Rules Committee was scheduled to consider Thursday afternoon. That amendment was released following several days of conversations, but no bill text, surrounding state waivers for some (or all—reports have varied on this front) of Obamacare’s “Big Four” regulations: guaranteed issue, community rating, essential health benefits, and actuarial value. Theoretically, states could use the risk pool funds to subsidize the costs of individuals with pre-existing conditions, should they decide to waive existing Obamacare regulations regarding the same. Given these developments regarding risk pools and waivers and regulations (oh my! ), it’s worth posing several key questions about the still-fluid discussions. 1. Do Republicans Believe in Limited Executive Authority? That’s essentially all the guidance given to CMS to administer a $15 billion program. Following consultations with stakeholders—the text requires such discussions, but doesn’t necessarily require CMS to listen to stakeholder input—the administration can define eligible individuals, the standards for qualification for the pools (both voluntary or automatic), the percentage of insurance premiums paid into the program, and the attachment points for insurers to receive payments from the program. This extremely broad language raises several potential concerns. Health and Human Services Secretary Tom Price has previously cited the number of references to “the Secretary shall” or “the Secretary may” in Obamacare as showing his ability to modify, change, or otherwise undermine the law. Republicans who give such a broad grant of authority to the executive would allow a future Democrat administration to return the favor. Nothing in the amendment text directs funding towards the states that actually use the waiver process being discussed. In other words, states that opt-out of the Obamacare regulations, and wish to use the funds to help individuals with pre-existing conditions affected by them, could lose out on funding to those states that retain all of the Obamacare regulations. The wide executive authority does little to preclude arbitrary decisions by the executive. If the administration wants to “come after” a state or an insurer, this broad grant of power may give the administration the ability to do so, by limiting the ability to claim program funds. As I have previously written, some conservatives may believe that the answer to Barack Obama’s executive unilateralism is not executive unilateralism from a Republican administration. Such a broad grant of authority to the executive in the risk pool program undermines that principle, and ultimately Congress’ Article I constitutional power. 2. Do Republicans Believe in Federalism? Section (c)(3) of the amendment text allows states to operate risk pools in their respective states, beginning in 2020. However, the text also states that the parameters under which those state pools operate will be set at the federal level by CMS. Some may find it slightly incongruous that, even as Congress debates allowing states to opt out of some of Obamacare’s regulations, it wants to retain control of this new pot of money at the federal level, albeit while letting states implement the federally defined standards. 3. How Is the New Funding for ‘Invisible High Risk Pools’ Much Different from Obamacare’s Reinsurance Program? The amendment language echoes Section 1341(b)(2) of Obamacare, which required the administration to establish payments to insurers for Obamacare’s reinsurance program. That existing reinsurance mechanism, like the proposed amendment text, has attachment points (an amount at which reinsurance kicks in) and co-insurance (health insurers will pay a certain percentage of claims above the attachment point, while the program funding will pay a certain percentage). Congressional leadership previously called the $20 billion in Obamacare reinsurance funding a “bailout” and “corporate welfare.” But the $15 billion in funding under the proposed amendment echoes the Obamacare mechanism—only with more details missing and less oversight. Why do Republicans now support a program suspiciously similar to one they previously opposed? 4. Why Do Conservatives Believe Any States Will Apply For Regulatory Waivers? The number of states that have repealed Obamacare’s Medicaid expansion thus far is a nice round figure: Zero. Given this experience, it’s worth asking whether any state would actually take Washington up on its offer to provide regulatory relief—particularly because Congress could decide to repeal all the regulations outright, but thus far has chosen not to. Moreover, if Congress places additional conditions on these waivers, as some lawmakers have discussed, even states that want to apply for them may not qualify. Obamacare already has a waiver process under which states can waive some of the law’s regulations, including the essential health benefits and actuarial value (but not guaranteed issue and community rating). However, those waiver requirements are so strict that no states have applied for these—health savings accounts and other consumer-directed health-care options likely do not meet the law’s criteria. If the House plan includes similarly strict criteria, the waivers will have little meaning. 5. Will the Administration Encourage States to Apply for Regulatory Waivers? President Trump has previously stated that he wants to keep Obamacare’s pre-existing conditions provisions. Those statements raise questions about how exactly the administration would implement a program seeking to waive those very protections. Would the administration actively encourage states to apply? If so, why won’t it support repealing those provisions outright, rather than requiring states to come to the federal government to ask permission? Conversely, if the administration wishes to discourage states from using this waiver program, it has levers to do so. As noted above, the current amendment language gives the administration very broad leeway regarding the $15 billion risk pool program, such that the administration could potentially deny funds to states that move to waive portions of the Obamacare regulations. The combination of the broad grant of authority to the executive, coupled with the president’s prior comments wanting to keep Obamacare’s pre-existing conditions provision, could lead some conservatives to question whether they are being led into a potential “bait-and-switch” scenario, whereby the regulatory flexibility promised prior to the bill’s passage suddenly disappears upon enactment.